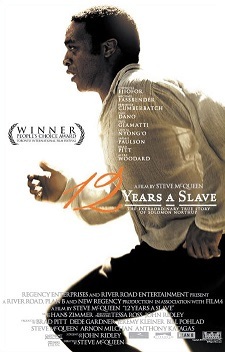 Steve McQueen’s third film (following Hunger and Shame) and a bona fide masterpiece, 12 Years is an unflinching, uncompromising look at slavery in the American south. It’s painful and emotionally harrowing, and makes no attempt to make anyone feel good about not only this history but the long-reaching effects of it, which we’re still feeling today. 12 Years is not The Help, congratulating white people for ending racism in 1962. Instead it holds up a mirror to an ugly, unavoidable truth and asks only that we accept it and then figure out how to move on from there. It’s a beautiful film, almost lyrical at times, even for all the ugliness it contains. And with a central message of hope and survival in the face of soul-crushing despair, it’s one that, even though there are no easy answers, doesn’t give up on the possibility of healing. It’s not an easy watch, but it’s a necessary one. It feels a little like cheating to include this movie, since it was released on HBO and not in theaters, but I have two other movies on this list that were year-end VOD/streaming surprises. I think we’re just going to have to get used to seeing movies that don’t have theatrical release, or have such extremely limited theatrical release that it doesn’t really count, included on year-end lists. At any rate, Candelabra is the movie that soured my appreciation of The Wolf of Wall Street. I liked Wolf all right until I re-watched Candelabra and remembered that indulgent, over-the-top biopics about indulgent, over-the-top people don’t also have to be self-indulgent films. 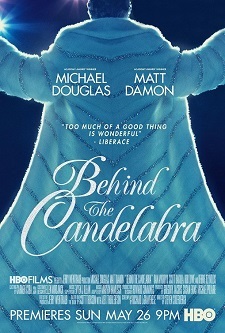 Candelabra is a boisterous, glitzy movie featuring career-best performances from Michael Douglas and Matt Damon, but Candelabra is at all times controlled and considered in its approach of the material. Director Steven Soderbergh revels in the excess and glamour of his subjects but he doesn’t get dragged down by those things (where Wolf becomes tedious and overbearing). It’s an exuberant film, celebratory even as the characters sink into paranoia, and was one of the most fun films to watch in 2013. I have rarely seen a movie affect an audience the way Blackfish does. It tells the story of Tilikum, the male orca captured as a baby off the coast of Iceland and raised in captivity, ending up as a star attraction at SeaWorld. Responsible for three deaths, Blackfish is a look at how a lifetime of abuse and neglect turned Tilikum into a real killer whale. The film not only traces Tilikum’s history, but also explains how orcas are simply too intelligent and emotionally complex for captivity. 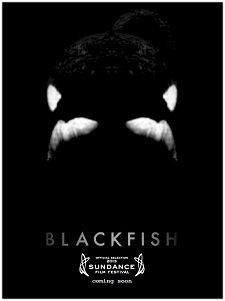 I almost went for the also-superb The Act of Killing as my favorite documentary of the year, but I gave Blackfish the edge because it has the ability to not only elucidate a topic most people don’t think about (which Killing also does for Indonesian death-squad leaders), but to change people’s minds. Blackfish doesn’t just ask us to think about orca captivity, it demands a response. This film, imported from France and winner of the Palme d’Or at Cannes, has been plagued by controversy all year, stemming from the lead actresses, Lea Seydoux (Mission: Impossible – Ghost Protocol) and Adele Exarchopoulos, fighting with director Abdellatif Kechiche over Kechiche’s techniques, which the actresses called exploitative and abusive. 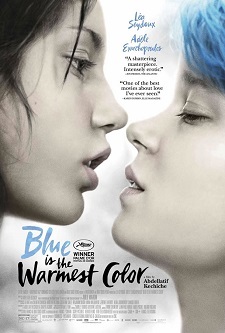 I’ve never been sure what to make of that, as it started to take on tones of grandstanding for publicity, from both sides, but the end result cannot be argued: Blue is the Warmest Color is a deeply felt, moving and evocative coming of age story, and Seydoux and Exarchopoulos give incredible, natural performances. Based on a French graphic novel, Blue follows Adele (Exarchopoulos) as she begins exploring her sexuality, first with a dissatisfying hetero experience and then with an explosive, awakening tryst with Emma (Seydoux). Blue has stuck with me not only for its honest examination of how love grows and dies, but also for how homophobia can poison a person’s life for years. Kechiche doesn’t dwell on the homophobic aspects of Adele’s life—both internal and external—but it is unmistakably there. Adele is a good person living a good life, but she’s never fully secure in her sexuality, and therefore she is never fully secure with Emma. Without being preachy or obvious, Blue makes a great plea for tolerance and acceptance. And the acting is, really, spectacular. 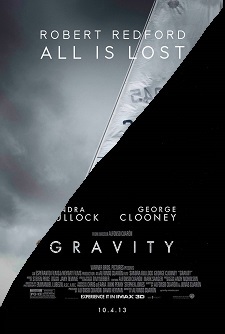 Two movies with a similar theme—everything is pointless and we all die alone—about people trying to survive in the two most inhospitable environments known to man (space and the ocean, respectively), and featuring bravura solo performances, Gravity and All Is Lost are essentially the same story told two different ways. Gravity is the “Hollywood”-style story, the one that invests in making the audience care about its lead (Sandra Bullock) and ultimately delivers a redeeming, happy ending. All Is Lost, on the other hand, doesn’t really care if you know the main character (Robert Redford, who is actually the only character in the movie), let alone like him, and the ending is ambiguous, left open to individual interpretation. They’re both gorgeous films, both emotionally complex, both landmark technical achievements, both Man vs. Nature survival stories. But Gravity wants you to like it; All Is Lost doesn’t care much either way. 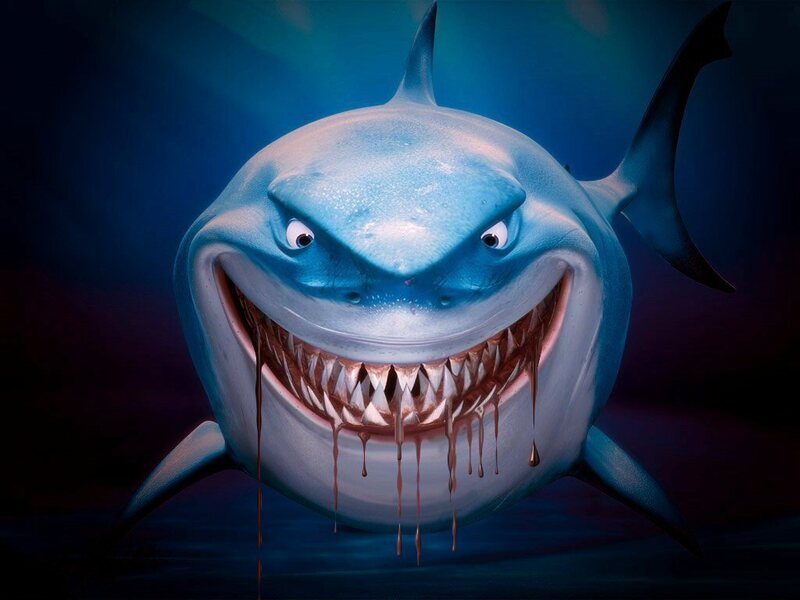 Paired together, they make an interesting case study for the kinds of compromises it takes to produce a Hollywood spectacle (look no further than their endings), but they’re also proof of innovative filmmaking and storytelling in a time when American cinema is often accused of being bankrupt of those things. I caught this right at the end of the year on demand and man, was I ever glad. 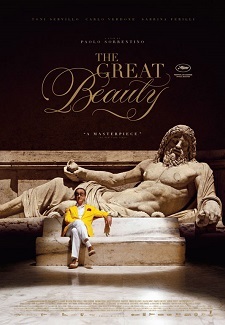 From Italian director Paolo Sorrentino, and in the tradition of Fellini’s La Dolce Vita, The Great Beauty is a lavish examination of Rome from the perspective of one of her most decadent citizens. Italian actor and director Toni Servillo stars at Jep, who, after his 65th birthday, looks back on his life in Rome during the late 20th century and new millennium, as Italy is wracked by political and financial scandals but is no less sumptuous and lively for the creeping cynicism that infects Jep’s worldview. Jep’s life unfolds in vignettes, each one as beautiful as the next and featuring some really gorgeous cinematography from Luca Bigazzi, and each one increasingly exhilarating. The Great Beauty is a wonderful, transporting film. My favorite film of 2013. Her is Spike Jonze’s latest, and it’s the one that definitively answers the question: Charlie Kaufman, or Spike Jonze? The answer is Jonze—Jonze the storyteller, Jonze the filmmaker, Jonze the auteur. Her is quiet and introspective, more interested in reflection than announcement, and in a year of big, glitzy movies about big, glitzy people, Her is a thoughtful whisper, a breathy What if. It’s a lovely look into one possible future, one in which technology has become integrated into daily life in a comprehensive way (imagine if Jarvis was real, and affordable). In this near-future, Theodore (Joaquin Phoenix) buys an operating system to be an electronic personal assistant and befriends his OS, who calls herself Samantha (and is brilliantly voiced by Scarlett Johansson), and they begin to fall in love. Far from taboo, though, in Theo’s world it isn’t unheard of for man and machine to form such relationships, and Her is as much about the nature of humanity and what it is to feel as it is a love story. Her goes into wide release on January 10. Make time to see it. The imagery of Chan-wook Park’s Stoker has stuck with me throughout the year. Bold, carefully colored, and richly realized, Stoker is a Southern Gothic horror story with incestuous overtones, but it’s not particularly the story that I remember. Instead it’s the performances from Nicole Kidman, a creepily engaging Matthew Goode, and Mia Wasikowska, and those stunning visuals. And also the sound design—I have been pointing to Stoker all year as an example of not only what sound design is, but why it matters. 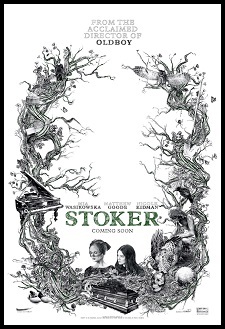 Exceptionally well put together and realized, Stoker is one of the best theater-going experiences I had all year. It took nine years for writer/director Shane Carruth to follow up his debut film, Primer, but Upstream Color is well worth the wait. It’s a dense, complicated film that has no easy resolution or narrative answers. It’s not for everybody, but if you want to experience something unique in cinema, Upstream Color is available on Netflix Instant now. The story is multi-layered and very, very dense (I still haven’t quite worked it out), and is about Kris (Amy Seimetz, The Killing), who is unwillingly subjected to some kind of drugging which leaves her confused and missing some time. The movie unwinds what happened to her—sort of—and continues on as she tries to pick up the pieces. It’s the kind of movie two people can watch together and end up with entirely different perspectives on what they just saw. Visually dynamic and well-constructed, Upstream Color isn’t like anything else seen this year. My second-favorite movie of the year, the final entry into Edgar Wright’s “Cornetto Flavors” trilogy is also the most sensitive and deep, but no less funny, movie Wright has made yet. 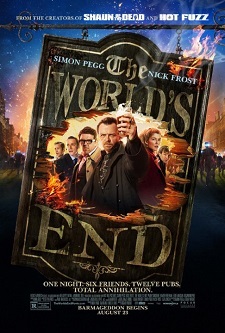 Co-written by Simon Pegg, who stars as Gary King, an unrepentant alcoholic and reprobate, End has not only the best action scenes of the year but some of the most satisfying arcs for not one but four characters in one movie. Pegg is at his best as King, but Nick Frost, Eddie Marsan and Paddy Considine also turn in great performances in a set of incredibly well written roles—Marsan, in particular, practically steals the whole movie with one monologue. But for all the humor—which improves on repeat viewings as jokes and gags build up in layers—it’s the way these characters interlock and change over the movie that makes The World’s End the best effort from Wright, Pegg & Co.
Just finished Stoker and I loved it. And I probably shouldn’t admit this, but I found Matthew Goode so attractive in the movie. Also, just wondering, when will he finally have his big breakout moment? I have no idea. He’s gotten some good work, he just needs something to take with the mainstream. Sometimes it really is just about luck. I’m so glad someone else didn’t like Nebraska either. It bored me to tears. I loved what you wrote about Stoker, All Is Lost/Gravity (I would have liked Gravity so much more if the ending had been different. For me it defeated all the emotional investment I had had during the entire thing), and Blue (how Adele is not getting nominated for everything but Amy Adams in AH is, is completely beyond me.) Can’t wait to see Her, it only comes out in the UK on Valentine’s Day, blah. 12 Years is my favourite film of the year, and probably ever. I just saw it for the second time yesterday and it was even more brilliant than I remembered.